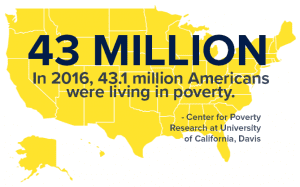 Whether traveling to meet with a family served by Nurse-Family Partnership, or experiencing it right here in Colorado, I am acutely aware of the challenges faced by those living in poverty, both on an individual and community level. As an individual or a family, homelessness, unemployment, intimate partner violence and other factors affect their ability to thrive and provide. When addressing poverty at this level, we know solutions exist and are being implemented successfully today. Evidence-based programs, like Nurse-Family Partnership, really do affect positive change. At a community level, these problems become a call to action – pushing effective programs to the forefront of community engagement and actively changing the landscape, economic health and well-being of all those tied to it. Federal, state and local governments continue to increase their investments in programs that focus on families most at risk and are demanding results worthy of the investment, and more importantly, worthy of the communities they serve. To deliver meaningful and sustainable change, we must expand the reach of these programs, including ours. Investing in the success of communities across the country is what we advocate for, and one way we ensure efficient and necessary growth is through technological advances within home-visiting. Talk to anyone working at our National Service Office and you will hear about “scaling” Nurse-Family Partnership. What exactly does that mean and how does technology play a part? When we talk about scale, we mean actively growing the size and reach of our program. Over 380,000 children are born into poverty each year, and we are simply not reaching all of the families that could benefit from our services. By 2023, Nurse-Family Partnership’s goal is to serve 100,000 families annually. To achieve this we must streamline processes, appropriately measure success and create transparency around our best practices. There needs to be a shift from creating solutions to executing upon our innovations and measuring its success. Technology allows us to define repeatable processes and automate previously manual tasks. By freeing-up valuable resources, we can focus more time and energy on the actual intervention. Remember when we reached into our glovebox for a folded paper map and scoured the lines for our destination? Today, we can take out a mobile device, click on an address and directions are dictated to us in real-time as we drive. Translate that time savings into dollars as a community health worker or, in our case, a public health nurse who travels to meet with families. Additionally, when you reduce unwanted administrative burden, productivity, engagement and creativity increase-leading to greater job satisfaction, increasing retention and lowering the cost of turnover. Technology provides visibility into our efforts, clarity around improvement and measures outcomes to ensure transparency around what’s working and what’s not. Decision makers can invest more strategically in their communities by utilizing data analytics. Today, data should be our barometer for success. The ability to hone in on specific data from a state level down to a community or neighborhood to measure effectiveness is a necessity and needs be a requirement of all programs to scale. We are using and incorporating technology into our everyday practice to improve the lives of the families we serve, easily access and track our data to ensure our outcomes and share information and collaborate. Nurse-Family Partnership is committed to reaching even more vulnerable first-time families and using a TwoGen approach to combat poverty at both the individual and community level, and we can’t do it alone. Learn more about how we help mom’s change the course of their lives and the lives of their families.